IBASSIN: 2017 Costa FLW Series 1000 Islands Day 1: Cory Johnston Leads with 23-07lbs! 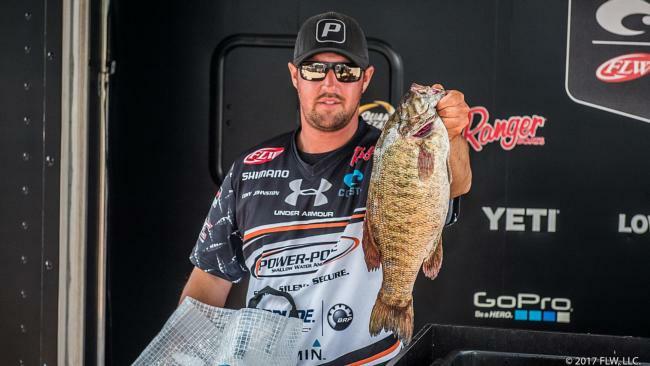 2017 Costa FLW Series 1000 Islands Day 1: Cory Johnston Leads with 23-07lbs! Cory becoming one of the hottest smallmouth sticks ever. Cory Johnston was the first man to weigh in, and he set the bar high on day one of the Costa FLW Series presented by Evinrude on the 1000 Islands. 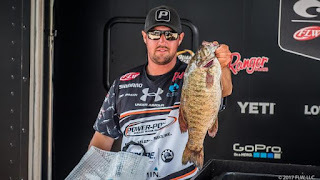 Leading off with 23 pounds, 7 ounces of smallmouths plucked from Lake Ontario and the St. Lawrence River, the FLW Tour pro leads by 9 ounces over fellow Tour pro Kurt Mitchell. Johnston is as local as they come, and between he and his brother, Chris, the pair has hundreds of days on the water at the 1000 Islands. Because of that, the leader from Cavan, Ontario, had plenty of options. Cory says he fished both shallow and deep, and landed 10 or 12 solid fish. He did lose a key 5-pounder late in the day. Fishing a deep spot in the river, the big smallmouth broke his line after surfacing near the boat.